Kids With Food Allergies (KFA) hosted a webinar on September 22, 2015 about Allergy-Friendly School Lunch Box Ideas. Registered dietitian Debra Indorato and blogger Keeley McGuire gave parents creative, nutritious and inspirational lunch ideas. Here is the video recording of the webinar. We have also included a list of related resources. Build lunches around a theme – superheroes, colors, letters. Build your own “lunchables” - include finger foods and dips. Get in fruits and vegetables through smoothies, dips and soups. Save time - make extra for dinner and pack hearty lunches the night before while you clean up. KFA thanks Debra and Keeley for donating their time to prepare and give this webinar. We also thank Mylan Specialty for sponsoring this webinar. Search for recipes without specific allergens. Browse through categories to find new ideas. Join and post for help with a recipe, for other cooking ideas, or ask about anything else! Check out our back-to-school lunch series: four weeks of tasty alternatives free of peanuts/tree nuts, milk, egg, and wheat! We also highlight recipes from our collection and feature guest food bloggers and chefs. Learn how to identify the foods you avoid. Use our "How to Read a Label Guides" for peanuts, tree nuts, milk, egg, wheat and soy. Balance your child’s diet if you are avoiding certain foods. A guide to understanding anaphylaxis or a serious allergic reaction. 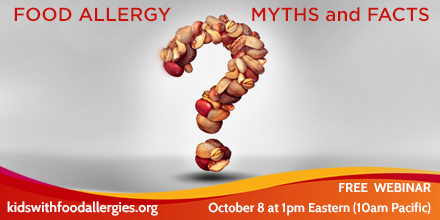 Take all allergic symptoms seriously! Both mild and severe symptoms can lead to anaphylaxis. Keeley McGuire shares recipes and lunchbox ideas as well as product finds. A school nutrition blog by author and educator Dayle Hayes, MS, RD. School nutrition expert, author and speaker Dayle Hayes, MS, RD and Debra Indorato, RD, LDN, discuss school meal regulations for students with food allergies, current thinking about food allergies in schools, and more. Cookbook author Colette Martin shows how to create allergen-free replacements for common pantry items. Colette Martin shares tips on using substitutes to bake without milk, eggs, soy, wheat, gluten and nuts. OUR NEXT WEBINAR – REGISTER NOW! of the Medical Scientific Council of the Asthma and Allergy Foundation of America. Your help allows our webinar series to be available to all families free of charge. We can give families managing food allergies the information they need to keep their children safe and healthy. Donate Now - Please give generously!